Words by Kevin Doocey on December 30, 2013 . News emerging from France (where else?!) suggest that Newcastle United director of football Joe Kinnear may not actually be drinking whiskey and relaxing beside the fire this Christmas period, rather instead, lining up moves for January targets. France Football is carrying a story claiming NUFC have tabled an offer for young French defender Nathan Dekoké. 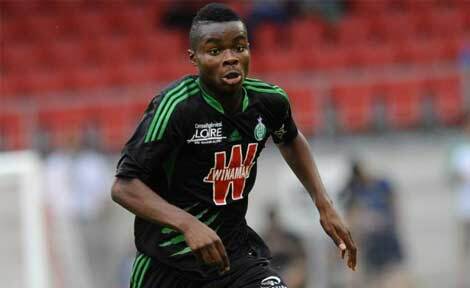 The 17 year-old is currently on the books of Saint Étienne but his contract expires in the summer of 2014 meaning he is open to offers. According to the article Newcastle have offered him a deal and could be followed closely by Fulham who are also keeping tabs on his progress. The French club would be due compensation should Dekoké decide to accept an offer from another club but the fee itself is likely to be minimal. While many Newcastle United fans will be looking to secure a deal for a striker in the coming window the noises coming from the club would indicate that Alan Pardew is planning for the future with the purchase of young players with potential to burn. I personally have never heard of Dekoké but he is capped at U-17 level for his national side so he must be held in high regard. Even from looking at his physique he is a big fella for his age. It will be interesting to see whether this deal goes ahead, and most importantly whether the club land a first team signing to aid our challenge for Europe. The Premier League campaign so far is panning out just like the season in which we finished fifth and with the correct purchases in January Newcastle United have the best chance in a long time to crack the Top 4 - albeit a huge ask. Regards Dekoké - if any of my readers know about him then please fill us in, in the comments section provided. Also - you can follow me on Twitter @KevinDoocey and make sure to like Tyne Time’s Facebook.